Premium car manufacturer Mercedes-Benz has taken the Dubai International Motor Show 2017 by storm with a dynamic line-up of its latest newly launched models and a number of visionary concept cars demonstrating the power and performance of electric drive. Mercedes-Benz is premiering three ground-breaking models to the region and displaying 24 of its latest models during the five-day event that ends on Saturday 18th November, all providing a glimpse of the latest technologies shaping the future of mobility. As the inventor of the automobile, Mercedes-Benz upholds its legacy of innovation through a focused strategy called CASE, based on four key pillars – Connectivity, Autonomous, Shared and Services and Electric Drive. This strategy has shaped the latest cars which combine exemplary performance with electric technology: the Mercedes-AMG Project ONE show car, the latest and most efficient Formula 1 hybrid technology and Mercedes-AMG GT Concept, blending sports car performance and maximum electric power. The two-seater supersports car, Mercedes-AMG Project ONE show car, brings the very latest and most efficient, fully-fledged Formula 1 hybrid technology from the race track to the road. The high-performance plug-in hybrid drive system consists of a highly integrated and intelligently networked unit comprising one hybrid, turbocharged combustion engine with a total of four electric motors. This show car is said to produce over 1,000 hp and reach top speeds beyond 350 km/h. The 1.6-litre V6 hybrid petrol engine with direct injection and electrically assisted single turbocharging comes directly from the Mercedes-AMG Petronas Formula 1 racing car. The electric motors on the front axle are also true rev wonders, with rotor revolutions up to 50,000 rpm – current state of the art is a speed of 20,000 rpm. The Mercedes-AMG GT Concept sports car from Affalterbach extends the AMG family by blending the high functionality of performance cars with the sportiness of AMG GT sports cars, and gives a bonus sneak preview of the exterior design coming to the series production model. The AMG GT Concept show car is the second AMG model to bear the new designation “EQ Power+,” a designation which all performance hybrids from Mercedes-AMG will be given in the future. The show car provides an outstanding performance with a sprint time of 0-100 km/h in less than 3 seconds. The AMG GT Concept is recognizable at first glance as a genuine AMG GT. The exterior design stands out with extremely muscular proportions and sensuous surface styling, with an unmistakable design idiom that features a deeply drawn hood and powerfully raked windscreen. Celebrating its regional premiere at the Dubai International Motor Show is the Mercedes-Maybach S 650, reaffirming its position as the ultimate model for individuality. The luxury brand combines the perfection of the Mercedes-Benz S-Class with the exclusivity of Maybach. As the world’s quietest production sedan with a spacious First-Class rear suite, refined materials and stylish controls, the new Maybach S-Class is the model ideal for passengers who seek the highest levels of comfort, luxury and exclusivity. The new model has been redesigned to offer refinements that accentuate the Mercedes-Maybach’s timelessly modern shape, from chrome detailing of its majestic façade to an elegantly sporting array of wheels. The spacious flagship model range exceeds the Mercedes-Benz S-Class by 20cm in both dimensions. Mercedes-Maybach S 650 is available in the region with prices starting from $209,300. The new Mercedes-Benz S-Class retains its title as the undisputed leader of intelligence, power, performance and luxury. The top-of-the-range model takes another big step towards autonomous driving and elevates Intelligent Drive to the next level. Its precise attention to detail is seen within every corner of the car, from the wood-leather steering wheel to the crystal-look tail lamps. The ENERGIZING comfort control is a world-first entering series production and can be experienced in all seats. This optional feature links various comfort systems in the vehicle together. It systematically uses the functions of the climate control system (including fragrancing) and the seats (heater, ventilation, massage), the panel heating as well as lighting and musical atmospheres, and enables a specific wellness set-up tailored to the mood and need of the customer. This enhances the physical comfort and performance while driving and during a break. The new Mercedes-Benz S 450 boasts a new V-6 engine that comes to the starting line with 270 kW (367 hp) and 500 Nm. The Mercedes-Benz S 450 is available in the GCC with prices starting from $109,950. The high-performance model of the new Mercedes-AMG S 63 4MATIC+ adds impressive power to the top-of-the-range collection. An updated front apron with jet wing underscores the more expressive appearance = at the rear, the new apron and modified tailpipe trim add distinctive design focuses. The new Mercedes-AMG S 63 4MATIC+ has been transformed with a new engine, new transmission, new all-wheel drive, new exterior and interior design, thereby dramatically honing the driving dynamics and looks further. It is equipped with the new AMG 4.0-litre V-8 Biturbo engine with cylinder deactivation, which replaces the previous 5.5-litre V-8 Biturbo engine. The new engine puts out 450 kW (612 hp) and thus exactly 20 kW (27 hp) more than the preceding model. With a sprint time of 3.5 seconds from zero to 100 km/h, the performance luxury sedan is on par with full-blooded sports cars. The Mercedes-AMG S 63 4MATIC+ is available in the GCC with prices starting from $174,950. The new Mercedes-AMG GLC 63 S 4MATIC+ combines exceptional performance, powered by an eight-cylinder biturbo engine for superior power delivery, along with a highly emotive, unmistakable engine sound. The new model has an acceleration of 0 – 100 km/h in 3.8 seconds. As a visual indication of its links with Mercedes-AMG sports cars, the GLC 63 S 4MATIC+ displays the AMG Panamericana grille, which was previously reserved for the AMG GT family. In addition, the car offers all the advantages of a Mercedes-SUV: ample room for passengers and luggage, comprehensive array of safety equipment and superior traction. The Mercedes-AMG GLC 63 S 4MATIC+ will be available in the GCC and Levant in 2018, with GCC prices starting from USD $ 100,750. Mercedes-AMG redefines the performance sedan by turning the most intelligent executive sedan into the most powerful E-Class of all time. Mercedes-AMG is also setting new benchmarks in this market segment with its innovative technologies – the intelligent drive strategy raises the limits of the performance sedan’s vehicle dynamics to a completely new level. The versatile AMG 4.0-litre twin-turbo V8 engine in the E 63 S 4MATIC+ takes peak performance to a new level at 450 kW (612 hp). Maximum torque attains a new top value of 850 Nm. It is available over a broad engine speed range of 2500 to 4500 rpm and so provides a feeling of effortless superiority in every accelerator pedal position. A sprint from zero to 100 km/h is absolved in 3.4 seconds. The E 63 S 4MATIC+ is available in the GCC with a starting price of USD 136,900. From the world’s most demanding racetrack directly onto the road: never before has Mercedes‑AMG packed so much motorsport technology into a production vehicle than into the new AMG GT R. The front-mid-engine concept with transaxle, the twin-turbo V-8 engine rated at 430 kW/585 hp, the extensively modified suspension, the new aerodynamics and the intelligent lightweight construction lay the foundations for an especially dynamic driving experience. Even from afar, the exclusive “AMG green hell magno” special paintwork leaves no doubt as to the sports car’s origin, having spent most of its development time in the “Green Hell” of the Nurburgring racetrack. The Mercedes-AMG GT R is available with a starting price of USD 173,050. Speed, performance and an unmistakable growl – as a third addition to the Mercedes-AMG GT family, the new AMG GT C Roadster enhances the portfolio with a completely new model variant. With an output of 410 kW (557 hp) and peak torque of 680 Nm, the AMG GT C Roadster is the most powerful new Roadster. In combination with the AMG RIDE CONTROL sports suspension, the AMG GT C Roadster guarantees dynamic performance at the highest level. A sprint from zero to 100 km/h is absolved in 3.7 seconds, and this thundering acceleration only ends at the top speed of 316 km/h. The AMG GT C Roadster rapidly transforms from a coupé to an open-top sports car, with speed, precision and ultimate style. The convertible fabric roof opens and closes in around 11 seconds, and can do this at speeds of up to 50 km/h. The Mercedes-AMG GT C Roadster is available in the region at a starting price of USD 172,650. Mercedes-Benz continued its reign as one of the most dynamic luxury automotive manufacturers at this year’s Dubai International Motor Show with a line-up that featured the introduction of four new models to the region – the Mercedes-Maybach Pullman, the G500 4×4², the Mercedes-AMG S 63 4MATIC Cabriolet and the Mercedes-AMG 63 Class Coupé. The new Mercedes-Maybach Pullman, is the second model from the Mercedes-Maybach’s ultra-luxurious family of cars. The top-of-the-range vehicle, with its face-to-face seating in the partitioned-off passenger compartment, stands as a proud example of the high-end automotive luxury traditionally associated with Maybach. Many governments, heads of state and royal families around the world have for decades chosen Mercedes-Benz saloons with the designation “Pullman” to drive them with the glory and style befitting their status. With its new model, the company is now extending its unique position in this distinctive segment. Only a G-Class can be better than a G-Class. This is the belief followed by the developers with the Mercedes-Benz G 63 AMG 6×6, and they are now stepping up a gear with the G 500 4×4². The near-series show car is a new highlight in the rich history of the G-Class and blends all the advantages of the model series. The new model takes the best off-road ability of the iconic G-Class to the next level and combines it with the Mercedes-Benz luxury with which owners are familiar. A pure new creation in the G-Class family, the G 500 4×4² understands the need for extreme off-road driving with no boundaries and at the same time, preserves the legendary Mercedes-Benz comfort and style. guise of the S 63 4MATIC Cabriolet. For the first time in its 48-year history, Mercedes‑Benz’s sports car and high-performance brand has introduced a four-seater Cabriolet in the S-Class segment, adding another head-turning model to its flagship range. Appealing to automobile enthusiasts with a desire for performance and luxury, the new model also offers its driver and up to three passengers space to travel in style. Its high-calibre statistics: 5.5-litre V8 biturbo engine with an output of 430 kW (585 hp) and peak torque of 900 Nm, AMG Performance 4MATIC all-wheel drive with rear-biased torque split as standard, acceleration from 0 to 100 km/h in 3.9 seconds and a high-performance composite brake system for optimum deceleration. Mercedes-AMG once again raises the bar in the automotive industry, with the new C 63 Coupé. Athletic and sporty, the vivid, sensual design of the new C 63 Coupé cuts a fine figure on the road and embodies modern luxury. At the same time, its interior raises elegance and style to a sporty level. A dynamically configured chassis, with optional air suspension, forms the basis for a high level of suspension comfort, low road roar and tyre vibration, agile handling, and driving pleasure. Lightweight construction to reduce weight, excellent aerodynamics and high-performance, efficient engines likewise play their part. The brand’s typical “Driving Performance” is taken to new heights with the C 63 Coupé thanks to its AMG 4.0-litre V8 biturbo engine with 350 kW (476 hp) or 375 kW (510 hp), a completely in-house development from Affalterbach. “Mercedes-Benz is delighted to play a significant role in the region’s most influential automotive show, an exhibition of the latest in car design and driving technology. Mercedes-Benz is the inventor of the automobile – and has shaped its future with passion since 1886 and today we are reaffirming this with the regional launch of four extraordinary models,” stated Mark De Haes, President & CEO, Daimler Middle East and Levant. With its distinct, emotive design, exclusive interior and impressive number of innovations, Mercedes-Benz is taking a big step into the future with the all-new E-Class. Recently I ventured to Daimler in Jebel Ali with a petrol head from Australia to pick up the E200 and we were both impressed with the numerous technical innovations in the E-Class that enable comfortable, safe driving on a new level, plus a new dimension in driver assistance. 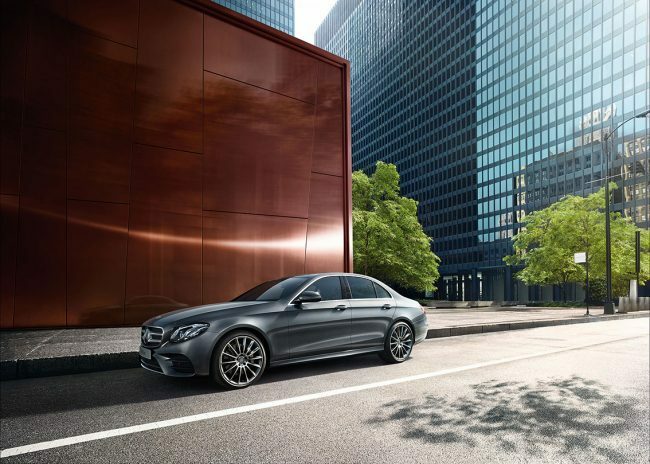 The design of the all-new E-Class is characterised by hallmark Mercedes-Benz sedan proportions. The elongated bonnet coupled with a coupé-esque roof and broad-shouldered tail end creates an exciting silhouette, while its new extended powerful vehicle body is characterised by short overhangs, a long wheelbase, large wheels and taut well-defined flanks that display a fresh, stylish and dynamic interpretation of the feature line. The interior of the all-new E-Class embodies the synthesis of emotion and intelligence and the entire cockpit is fully digital. The driver is free to configure the information and views of relevance for them and thus create their own personal cockpit. In a first for a car, the steering wheel features touch-sensitive Touch Controls that, like a smartphone interface, respond precisely to horizontal and vertical swiping movements. In keeping with the motto “hands on the wheel, eyes on the road“, this allows minimum driver distraction to be achieved. The last Mercedes I drove was impressive but then most memorable part was the re-contouring seats. In the E-class, the ergonomic seats reflect Mercedes-Benz’s hallmark suitability for long journeys with a refined, sporty look, featuring a unique design for each line. Furthermore, Active Multicontour Seat package is also available as an option for the front seats. This includes the following functions: Energizing Massage, dynamic seat, multicontour backrest and – new – the active cushion. An all-new infotainment generation is making its debut in the E-Class equipped with COMAND Online. Its highlights, alongside the double display, include the touch-sensitive Touch Controls on the steering wheel and the new, intelligent graphic design of the Multifunction Telephony. It allows mobile phones to be charged and, at the same time, connected to the vehicle’s exterior aerial – with absolutely no need for cables or a telephone holder. The interior lighting makes exclusive use of durable, energy-saving LED technology. The same applies to the enhanced ambient lighting included in the lines. With 64 colours, it offers a host of possibilities for personalisation throughout the interior. The suspension on the all-new E-Class, with three options of selective damping, offers agile driving pleasure and the highest level of ride comfort in this segment. Mercedes is back in the good books of diva…after their big foray into 6×6 (I really think they should stay out of this segment and stick to their awesome luxury cars), I got news via Bassam that with the new A 250 Sport, Mercedes-Benz has entered an entirely new segment in the Middle East in the luxury compact segment. I was cynical at first (especially after getting over the 6×6 news)…. it’s just not very ‘Mercedes’ but then I was converted when I saw the images – it certainly looks like a powerful, sporty and luxuriously designed hot hatch that will excite and enthrall the region’s aspirational go-getters of the next-cool-things. I can only comment on the tech specs and the looks for now because I have not driven the car so my opinion on this is purely from a perspective of someone who loves cars and can comment on the looks and power based on previous experience. It is apparently a powerful four-cylinder, two-litre turbocharged engine that produces a roaring 211 hp and 350 Nm of torque, thundering a market that demands success to 100km/h in just 6.6 seconds….cool aye! Like most Mercs, it comes with GCC standard specifications and is fully loaded compared to the international market, including a very sporty interior design with red stitching, designo red seat belts, red framed SLS AMG style air vents, comfortable sport seats, aggressive exterior look with diamond grille, red brake callipers, 18” five spoke AMG light-alloy wheels in high sheen black finish and headlamps with red marker rings. For safety, the standard specification includes, amongst other things, the radar-based COLLISION PREVENTION ASSIST system. Smiles will broaden when learning that ownership of a car sporting the unmistakable status of the sparkling three-pointed star starts at just USD$37,000 GCC wide. GCC options in addition to the standard specification include Xenon Lights, Active Parking Assist, and a Light Sight Package (Interior Ambient Lighting). Launched with the tagline ‘Drive yourself’, the arrival of the A 250 Sport to the region aims to turn the luxury small car segment on its head and marks a new direction for Mercedes-Benz in the region. In summary…the car has good looks, performance, prestige and attitude, at a price point that makes attainability of the brand a reality for those that may consider owning a Mercedes-Benz as ‘something they want but sometime in the future’.